Surrey, BC - The Surrey Eagles Hockey Club announced on Monday that Matt Erhart will not be returning as the Head Coach and General Manager of the hockey club as he will join the Vancouver Giants of the Western Hockey League as an Assistant Coach. With Erhart's departure, the Eagles are pleased to announce that President Peter Schaefer will take over the roles of General Manager and Head Coach. "We're happy for Matt," said Eagles majority owner Chuck Westgard. "He wants to further his coaching career, and this is a great opportunity that he couldn't turn down. We're sad to lose him as he's been fabulous over the past few years, but at the same time, we're very confident with Peter taking over. He showed this year that he's passionate about coaching, and we're excited to have him as our Head Coach and General Manager for the upcoming season." During his three years as bench boss of the Birds, Erhart compiled an impressive record of 106-50-6-14. In each year during his tenure, the Eagles won a minimum of 35 games in the regular season and made it at least as far as the Conference Final in the playoffs. After the 2011-2012 season, Erhart was named the Coastal Conference winner of the Joe Tennant Memorial Trophy as coach of the year. The Delta native, who won an RBC Cup as a player with the Eagles in 1998, came within two wins of replicating the feat as a coach when he led the 2012-2013 edition of the team to a semi-final berth at the national championship tournament after winning the BCHL's Fred Page Cup and the first ever Western Canada Cup. "It's a bittersweet day when you have to leave a program that you've been a part of as a player and a coach," said Erhart. "The Eagles gave me a great opportunity to be a Head Coach and General Manager in the BCHL, and I'll always be thankful for that. With the Giants, it's a chance to further my coaching career, and I couldn't pass it up. It was a pleasure to work with the coaches over the past three seasons in Surrey, and I'm very excited that Peter will be taking over as Head Coach and GM. He'll do an excellent job with the returning players and recruits going forward." 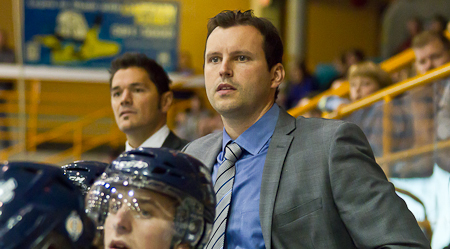 After a lengthy playing career in the professional ranks that included NHL stops in Vancouver, Ottawa and Boston, Schaefer joined the Eagles as an Assistant Coach at the start of the 2012-2013 season. Following Surrey's run to the semi-final at the RBC Cup, the Yellow Grass, Saskatchewan native was named the President of the team and is looking forward to taking over for Erhart behind the bench. "I'm excited," said Schaefer. "I learned a lot from Matt this past year, and we had a long and successful season. Now I'll have to take that knowledge and apply it going forward. With Matt moving on, I'm looking forward to working with the returning veterans and the up-and-coming new recruits." The Eagles would like to thank Erhart for his time spent in the organization and wish him all the best in his future endeavours.